Climate change means a £30m pipeline is needed in the East Midlands to ensure that supplies reach some homes, according to a water supplier. Severn Trent Water said that in five years' time demand could outstrip supply by millions of gallons a day. The firm said the new pipeline would overcome a bottleneck in Severn Trent's distribution system near Derby. If approved, the 20-mile (32km) underground pipe will carry enough water to supply 100,000 people. The new pipe will run from Church Wilne, east of Derby, to Hallgates, near Leicester, to open the bottleneck in the existing pipe which runs from the Ladybower Reservoir in Derbyshire to Cropston Reservoir, near Leicester. The water company said the cost of the project has been included in a plan to increase bills by 1% over the five years from 2010. 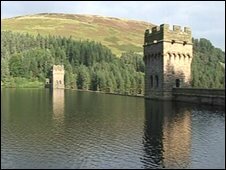 Those proposals have to be agreed by the water regulator OFWAT in its price review. Paul Baxter from Severn Trent said: "Climate change is the biggest issue that's affecting us in our supply and demand balance. "And that's why we have to take action now to ensure that our customers have a water supply that they can rely on the future."